a naturally occurring amino acid, one of those essential for human metabolism, necessary for optimal growth in human infants and for maintenance of nitrogen equilibrium in adults. The acetate and hydrochloride salts are used for dietary supplementation and the hydrochloride salt is used for the treatment of severe metabolic acidosis refractory to other treatment. 2,6-Diaminohexanoic acid; the l-isomer is a nutritionally essential α-amino acid of mammals found in many proteins; distinguished by an ε-amino group. /ly·sine/ (Lys) (K) (li´sēn) a naturally occurring, essential amino acid, necessary for optimal growth in human infants and for maintenance of nitrogen equilibrium in adults. The acetate and hydrochloride salts are used in dietary supplementation and the hydrochloride salt is used in the treatment of severe metabolic alkalosis refractory to treatment. An essential amino acid, C6H14N2O2, obtained by the hydrolysis of proteins and required by the body for optimum growth. an essential amino acid needed for proper growth in infants and for maintenance of nitrogen balance in adults. See also amino acid, protein. A nutritionally essential α-amino acid found in many proteins; distinguished by an ε-amino group. Fig. 214 Lysine . Molecular structure. 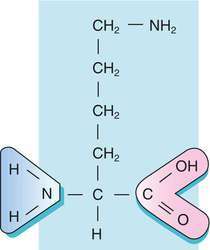 one of 20 AMINO ACIDS common in proteins, having an extra basic group and being alkaline in solution. See Fig. 214 . The ISOELECTRIC POINT of lysine is 10.0.
n Scientific name: 2,6-diaminohexanoic acid. An essential amino acid found in dairy and meat products, wheat germ, and brewer's yeast. Used to treat cold sores and herpes simplex infections, Bell's palsy, and rheumatoid arthritis. Not for use during pregnancy or lactation or by infants or children. A nutritionally essential α-amino acid found in many proteins. n one of the essential amino acids found in many proteins; needed for proper growth in infants and for maintenance of nitrogen balance in adults. See also amino acids. Lys; a naturally occurring, essential amino acid, important in the formation of collagen, fibrin and keratin. Often the first limiting essential amino acid in growth and production. Nutritional deficiency in Bronzewing turkeys causes deficient pigmentation in the feathers.